We have five kids and I'm pregnant with my sixth. I am a stay at home mom. My husband is a public high school teacher. Our family of eight lives in a three bedroom ranch, a solidly built home with a nice, large, unfinished basement, thread-bare carpet, rickety windows that will shatter into dangerous shards, nice-enough-but-really-pretty-ugly bathrooms and kitchen, and a nice big yard that would be amazing after about $2,000 worth of work. Okay, actually the yard just is amazing but I would really love to put in about $2,000 worth of work into it (evergreens for privacy here, a gorgeous waterfall there, a fire pit, some boxwoods and Rose of Sharons by the fence, and more mulch than you can imagine). We drive around in a mini-van with a wonky radiator. If you ever see me on the side of the road with the hood up I am probably fine, I just need to release the pressure that has built up from air bubbles in the coolant. When the new baby comes we won't all fit in it and our best chance for a new one is tax refund time, though that money was supposed to go towards new windows and paying down debt. Why am I telling you all this? Because I'm prone to over-sharing a bit, but also because I have had some friends specifically request that I write about how our family manages to get by financially with so many mouths to feed, and how we decide to bring more kids into our budget-tight family. I don't really have a very pretty answer, nor an easy one. We live right at the poverty line for the state of Illinois but I don't think we are what you would think of when you picture a family living in poverty. We have cell phones, Netflix, wifi, two cars, toys to play with, clothes to wear, and food to eat. We send our kids to private school. I have a KitchenAid mixer and we have an iPad. Now most of those things were gifts, or second hand, or straight out charity, or floor models purchased at deep holiday discounts with money from second jobs (looking at you, mixer). Of course you wouldn’t know that and so I wonder about all the other families who live at or below the poverty line. I wonder how many live around me and how many I know and how similar we are. I wonder if they have ever cried with worry about how they will pay bills or buy Christmas presents. I wonder if they’ve ever had to put food back on the shelf at the grocery store. I wonder if they ever have to confess resenting people who tell them they went to Disney but it was affordable because they didn’t stay at a park hotel. I wonder if they worry about the balance of feeding their family on a limited budget and having malnourished kids. Mostly I think about it when it comes to food. Right now I have a container of chai tea concentrate in the fridge. It was on sale for just under $3 and usually it costs almost $5. I know this because I look at it every week at the grocery store and wish I could buy it. But I can't afford $5 for chai tea concentrate and so 48 weeks out of the year I do not make that purchase. $5 can buy two packages of the Turkey Selects hot dogs, possibly 2lbs of sausage, a gallon of milk and a carton of eggs, five loaves of bread, five bags of frozen veggies, a variety of fresh produce, two boxes of cereal, a canister of oatmeal and James' milk, a pound of ground beef, two bags of chips, a package of diapers, OR a tube of toothpaste and some tissues. $5 buys things my family needs and so, unless I have extra pocket money, I don't spend that money on something I want. But two weeks ago I had a bit of extra money and the chai was on sale and so I splurged and bought it. I've been enjoying it but every time I look in the fridge and see the chai sitting there but not a lot of anything else I feel guilty. I wish I wouldn't have bought the chai. Now, we use the envelope system. Twice a month, when my husband is paid, I am given $300. I use $50 for gas, which has to last for 2 weeks. I use $120 each Monday for groceries for the week. I have $10 left over - sometimes more when gas is cheap - to spend as I wish. Sometimes that buys us a convenient McDonald's dinner or at least a large diet Dr. Pepper to soothe my worried mind. Sometimes it buys a kid's birthday present or pays for a field trip. Sometimes I use it to buy gas because we've driven a little bit more than usual and I have no more cash for gas. Sometimes I spend it on groceries because $120 doesn't always get too far. All this to say: I shouldn't have bought that chai. I should I have purchased some more frozen veggies or a pint of strawberries. My $10 of “mad money” isn’t really mine - it’s buffer money - and I hate that I was selfish and impulsive. The funny thing is, if our student loans were all paid off we would be totally comfortable living off my husband’s paycheck and the little side jobs we do. My loan is almost gone (less than $3k left) but my husband’s loans will be around for awhile. We have a bit of credit card debt - something we wouldn’t have if we didn’t have the student loans, if we weren’t living in fixer-uppers, and if we weren’t occasionally stupid - and looking at our budget we know that to get rid of those things would be incredibly freeing for our family. We don’t regret our college educations but we do regret other financial decisions we made, especially early on in our marriage. So I’m just throwing that out there: if we had less debt to pay on each month our family of almost eight would be living comfortably while still sitting at the poverty line. There still wouldn’t be Disney vacations, but we wouldn’t be worried about buying a new van, or having an extra $50 a month in the grocery budget, and we wouldn’t have to pick up extra work for swimming lessons. And how have we discerned to have more kids? Well, we haven’t - not since Resa. All of our boys and the baby I’m currently pregnant with have been surprises. Honestly, with our financial situation I feel like we have just reason to not have any more babies for awhile, if ever again. But obviously, God thought otherwise. My super fertility, the long periods of abstinence that comes with it, and the super tight budget it has brought has all made me spend a great deal of time reflecting on what the Church teaches about vocations and marriage. 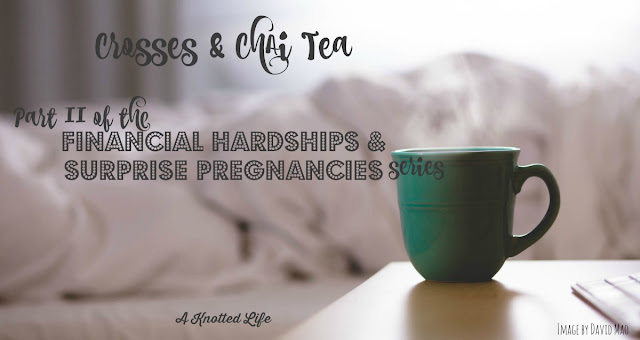 I am convinced that there are things about me, Travis, and our marriage that need to be refined, made holier, and purified, and God is allowing us to suffer through financial hardship while asking us to joyfully accept surprise pregnancies so that very act of sanctification can happen. My crosses and blessings are mine - God has specifically picked them out for me so that I can better do what I want most: to know, love, and serve Him and to be holy as He is holy. Every individual’s crosses and blessings are just as specific to them, especially for those of us who are striving to follow the Lord. God has lovingly picked them all out for all of us. So did I believe we should probably be done? Yes. Was that partially because of fear and anxiety? Yes. Does perfect love cast out fear? Yes. Do I feel like God is asking me to trust Him? Yes. So I will trust and we’ll keep doing what we’re doing, loving one another and our kiddos and our God. And very, very rarely splurging on chai tea concentrate. You can come back tomorrow for final post How We Make It Work, where I talk about what we actually do to stretch our dollars, live off one salary, and provide for a family of 8. And if you haven't read the Introduction yet, please click here. This really spoke to me today, Bonnie. Although our crosses look different they lead us towards loving the same God more deeply and widely, something that I've chosen to forget lately. Thank you for helping me to think differently about those the Lord has chosen for me. And thank you for your honesty!! Thank you so much for writing. I've been wanting to share a bit about our situation too, but honestly, I'm not ready! I would love to hear more about how you deal with the emotion behind all of it. I love what you say about guilt with the chai tea. I'm slowly getting to the point where I feel a similar guilt (I too have a box of chai concentrate in my fridge... sigh). But more so, I'd love to hear how you deal with the desire to do more, have more... but knowing you can't. I have a hard time relating to friends who are a bit more particular about their food choices than we are. I would love to have the same opinions (because I do!) but frankly, the budget rules more so than the nutrition label. It's hard to have conversations with friends at times without going too far into detail about why I choose differently. It's so silly! Oh this is so, so good. "So did I believe we should probably be done? Yes. Was that partially because of fear and anxiety? Yes. Does perfect love cast out fear? Yes. Do I feel like God is asking me to trust Him? Yes. So I will trust and we’ll keep doing what we’re doing, loving one another and our kiddos and our God. And very, very rarely splurging on chai tea concentrate." <----- so beautiful thank you. Thank you for sharing this beautiful post! That was beautiful Bonnie. Thank you so much for sharing! I'm married to a teacher and we have five kids, and I stay at home. I so get this. This is probably silly, because I'm sure you know about it, but have you looked into income based loan repayment? It only works with federal loans, though. When my husband was in grad school, things were sooooo tight. Sometimes I look back and wonder how we did it. Cloth diapers because we couldn't afford disposables. Dollar store type presents. My wardrobe was...really sad. The kids were dressed fine because people were wonderful giving hand me downs. It was hard. But we got through it, and although it's nice that we don't gave to stress so much about money now (although we are far from Rich or even "comfortably middle class), at least we know we can get by on less if we have to. Beautifully written, Bonnie! My husband and I have used the envelope system and loved it. We have been married 18 years and the simplicity of having less is a beautiful thing and fosters a family closeness that can be lost when material things are more abundant. Prayer for you all as you continue your journey to become debt free! "Every individual’s crosses and blessings are just as specific to them, especially for those of us who are striving to follow the Lord. God has lovingly picked them all out for all of us." So beautiful, Bonnie. Thanks for this reminder! Thank you for sharing your heart. I have no doubt that God is going to use these words in ways you could not even possibly imagine! Envelope-ers unite! I often think of Doug Stone's Little Houses song when I think about our house, because it's so apt! And oddly enough it encourages me... As Dave Ramsey says, "Live like no one else (today), so that you can Live like no one else!" Thank you for sharing Bonnie! Thank you for sharing this! This so describes our family -- I'm pregnant with number seven and my husband works for the school system as well. And yes, a frequent confession is being jealous of others,mostly in what they're able to do/give their kids :( Thanks for this series; it helps to know I'm not alone, as there aren't any other large families near me (Catholic or otherwise). I am so impressed with you Bonnie. I am totally a money girl and a worker bee and so I choose to work part time but God has blessed me abundantly with jobs that I can mostly do from home. But my mind often wanders off to what life would be like if I didn't work at all. I wonder if I could do it or not, live on a tight budget like you do and if it would be better for our family. It really hit me that you can't even buy yourself tea, that is a huge sacrifice that you are making because you value staying home that much. I just know that you will be rewarded for this. I really appreciate your honesty. Bonnie, I love you, your honesty and your amazingly full heart. Thank you for showing us that sacrifice looks different for everyone, but in the end, we do it because we love - with everything we have. Love, love this series. Thanks for sharing and opening up in such a real way (one of the reason I like your blog)...we love using the envelope system, helps work through this nasty debt! This is wonderful, thank you for being so open. Surprise pregnancy here too, under dire financial circumstances that prevent me from staying home with the kids, and when I think about the fact that in a few short months I'm going to have to leave yet another tiny baby in the care of others I just . . . anyway, thank you. That is the hardest thing, looking down at your growing belly knowing somebody else will be caring for the baby. Solidarity, sister. THIS!!!!! We desperately need more women telling their honest stories, especially as it pertains to openness to life. Thank you, Bonnie. Debt is the worst. As we were paying ours off, I had $20 for the month called, 'mommy money' that I could spend as I wished, like you, I always felt so guilty about whatever it was that I did with it. Thanks for sharing so openly, particularly the reality of children when reason is there/could be there to hold off. I have a really hard time with this, a lot of fear, a lot of anxiety. though our struggle is not financial, medically and physically it would be really challenging to have another child- and looking at the mountain of extended abstinence and monthly anxiety is already starting to weigh on me, not one month after our newest baby. Not really going anywhere with that thought except to say, "ugh, me too, but for different reasons". AND, I'll also add, thanks for saying this. "My crosses and blessings are mine - God has specifically picked them out for me so that I can better do what I want most: to know, love, and serve Him and to be holy as He is holy. Every individual’s crosses and blessings are just as specific to them, especially for those of us who are striving to follow the Lord. God has lovingly picked them all out for all of us. " I love this. Thank you (and your husband) for being open & honest about your situation. It is an encouragement to me as my husband and I try for our first baby knowing full well that money will be tight on his teacher salary and my outrageous student loan debt. If God is calling us to have children and we trust in Him without reservation, I know He will provide. Maybe not an abundance of cash, but certainly an abundance of joy! You are a gift, Bonnie! What you say about crosses is so true. Thank you for reminding me that He "lovingly picked" mine for me. I totally needed to be reminded today because I have been having a bit of a pity party. Bonnie, you are a beautiful witness to living a life focused on the Lord. I so appreciate your honesty in sharing this. Thank you so much for opening yourself up. Have you looked into public assistance at all. If you are on the poverty line, then I think you would qualify for WIC at least (and maybe SNAP too??). It might give you some wiggle room in your food budget, ease some of your struggles and let you have little indulgances like chai tea? Just maybe something to prayerfully consider. I do believe those programs are in place to help hard-working families such as yours. Thank you again for your honesty and openness and I'm so glad I got the chance to meet you last March!! You just described my life. Thank you. Angel, Travis and I are so grateful for you guys, too! "Every individual’s crosses and blessings are just as specific to them, especially for those of us who are striving to follow the Lord." Thank you so much for your honesty and openness. We have very different crosses when it comes to children, as mine mostly live in heaven. Sometimes I get so wrapped up in my own suffering that I forget that were they here, while it would likely be a full and happy life, my daily challenges would be different. I think if more of us shared openly about our struggles, we would be able to better help and serve each other, and would also better appreciate the blessings we each have. So honest and beautiful. Thank you for sharing so deeply. You are touching so many lives with this - a ripple effect of exactly what you write about, giving of yourself in faith. We budget carefully, too, and I often think we have it tough but I guess we have a little more wiggle room than you. No debts besides the mortgage helps. I hope once you get your student loans gone forever things get a bit better! We do $110 per week on groceries for the eight of us. We eat well because I am careful and make everything myself. Our kids always have plenty of nice clothes because my mom and I are yardsalers and my MIL can't stay out of the upscale resale shops. (Me getting to Goodwill alone is another story...my kids are better dressed than I am!) We do qualify for WIC but I feel bad getting it because I know we manage fine, plus I am not sure I want Big Brother watching me so carefully. With care, we have a few hundred left over every month and can afford to do projects on our house and farm. Thank you for reminding me what blessing this is. It is too easy for me to think that if only there was *more* extra, we could grow the orchard faster, or get the cow sooner...but we are very blessed with what we have. You are a strong woman, Bonnie. God bless you and your husband and the work you are doing. I know He sees it. Another thing I always wonder: we have everything we need and some things we want on one lab tech's salary. What do people with less kids and two incomes DO with their money? I am mystified as to where it all goes. My husband and I both work and have two children. We would like more, but we have our own personal reasons as to why we are using NFP to avoid pregnancies for now. What do I use our double income for? I admit I do buy my children new clothes. They also receive clothes for Christmas and birthday gifts. My younger daughter wears her sister's hand-me-downs, but she also occassionally gets new clothes as she has a much different build than her sister. After both girls have outgrown clothing, we donate it. When special occasions come along, we donate old toys before making room for new ones. We do not spend a lot on birthdays or Christmas as family will usually buy them plenty of gifts. Both of my girls play tball because we want them to learn to interact with their own groups of peers. It is one of the cheapest sports around. We have only been to the movies once, choosing to subscribe to Netflix or visit the library for our movies. We rarely go on dates because we live over 900 miles away from family, so baby-sitting is not worth the cost. So, yes, I know how to live frugally. What do I DO with my income? I'm saving it for a treatment for my daughters' food allergies. If my daughters can live a life without worrying about having an anaphylactic reaction, then it's worth it. If you don't know my reasons for having two kids and a double income, please don't judge me. Emily - your question has been weighing on me for a bit now, so I hope it's okay if I come back in a little late in the game to answer it. We're a double income family (neither of those salaries is even medium sized and living on one only became imaginable in the last year or so) with only one kid (and 4 in heaven). Sadly this is the mindset that I assume most people have about my family at church and out in the world - clearly our two incomes and single child must mean something horrible. I'm not taking your question personally, but I did want to give you an idea of of what we do with our money - first off our money and family is constantly ready to welcome another living member, in the months where this doesn't happen our money goes toward debt - so that if we never having another living child we can afford to adopt or foster, in the months where we yet again don't conceive or are pregnant and/miscarrying t a good amount of our income goes towards families blessed with more living children - whether through giving to friends or charity, in those months we also help support elderly and retired family members. I won't deny that my husband and I have a little more spending money than some friends, that we don't have to budget as tightly as others, we have a few more comforts and ease in this way in our lives (though check off just as many things on the frugal checklist as others), but a lot of our income goes to others while we continue to wait with open arms for more children. I know my family probably isn't the type your asking about - we're not the ones living on two incomes with fancy cars or vacations or things, things, things, but it stings all the same to know there are people out there who think we're like that because of circumstances outside of our control. If the Angel Gabriel came to our door this minute and asked us to give up our second income, our house, our things in return for even just one more living child, our answer would be without hesitation "yes", but at the moment we're trying to find something good that comes with our circumstances - and being able to have a second income, with the idea of using it to help support others who don't have that option is a big part of what we feel called to as Christians. Thank you for sharing this. 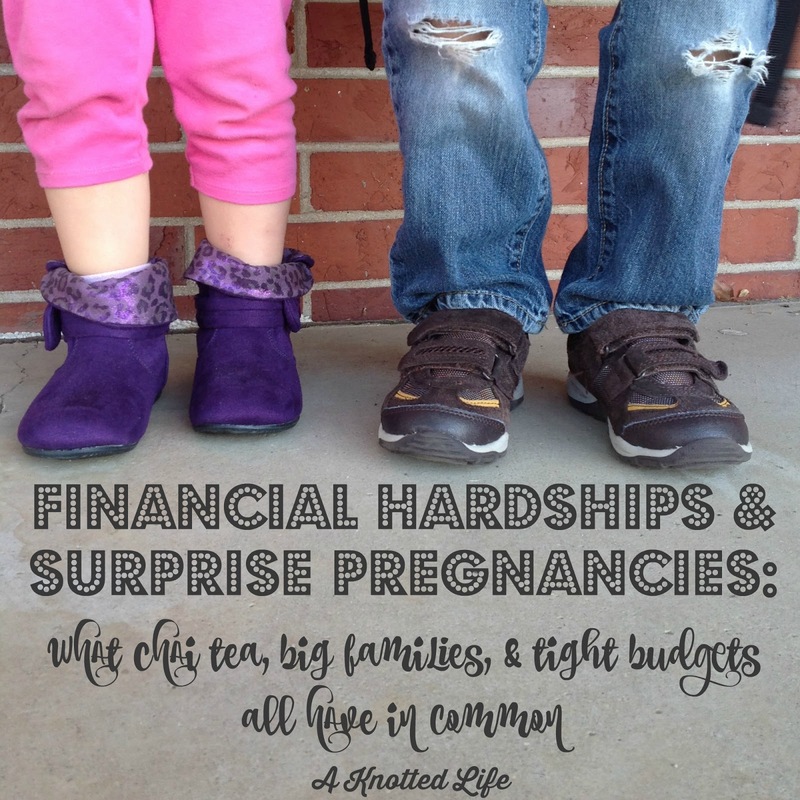 We are expecting our third child and I have been worrying about money. This is helpful. As regards the chai... I was thinking about it on my way home from work this evening and wanted to share with you how I make my chai tea. You can get tea bags of chai (I think twenty-four in a box?). I use the Tazo brand. I just make it like regular hot tea (tea bag and hot water) and then add milk and sugar. It might not be quite as rich as the concentrate, but it still has all the flavor and I think it's just as good. I didn't do it for cost reasons; I needed decaf and the cartons are caffeinated. But I thought perhaps this is a way you can still enjoy chai tea without the guilt. Congrats on your growing family and thanks again for you words of wisdom. So incredibly much empathy on the finances. Open and honest and helpful. Thanks for sharing. Thank you for this honest series. So much of this resonates with me. Only I work outside the home and my husband is the stay at home dad. You are touching many lives. Thanks for this post, Bonnie. I'm grateful you shared it. I am one of your newest followers. I loved this. Thanks for being so raw and reminding us of the "toil" that this life offers us compared to the joys of heaven.